Example of Compound Interest - and Investment Length to achieve that. This morning, one of my senior posted in his Facebook regarding THB 240m (240 million) house, that was widely known as FAKE NEWS, accused current Army chief, i.e. Commander in chief, General Apirat Kongsompong that he owned one of the residence cost THB 240m. It was probably spread false rumours by political opponent to this government, of which, I would not want to mention it here. What so interesting about my senior's post was the fact that he made assumption (as a joke, but quite entertaining) that one who save THB 50,000 per month, with high-risks (high-performance) investment that yield 30% annually, can own such kind of house within 17 years. That was part of it. And to give you example of how long would it take for anyone who can save up to THB 50,000 with 30% interest, to get THB 240m house, we simple will play around with Compound Interest Formula, but I will not go into that details because it in unnecessary since there are online calculator available for anyone to check. 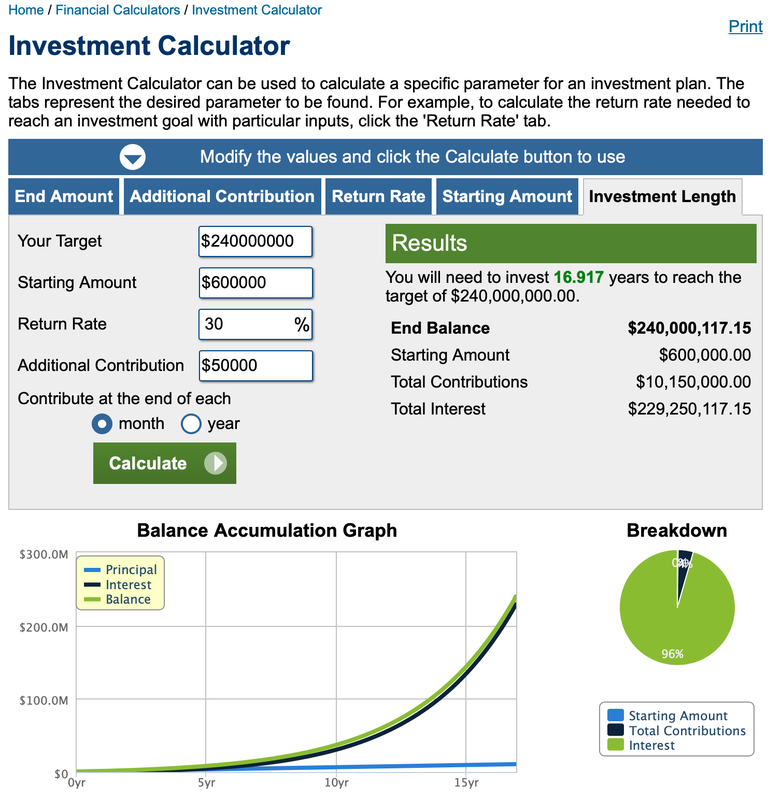 And the one that I like came from CALCULATOR.NET - in Investment Calculator section. And the result is quite impressive, i.e. around 17 years with as little as 600,000 principle (12 x 50,000) as shown above. Anyway, all magic came from Compound Interest.